Our kids (Collins, 5 and Titan, 3) chose our costumes this year and our family knows, I don't do Halloween lightly. My husband Josh is a 6'5", 300 lb man and our son (who is obsessed with Hulk) swears his Daddy IS the Hulk. Josh's costume and accessories were purchased online, though I made alterations, painted his mask hair black (it was gray), added extra comfort padding inside the mask, and added strong Velcro along the back of his costume. Titan's mini Hulk costume was purchased at a store, but I wasn't a fan of the unrealistic pants it had on it. 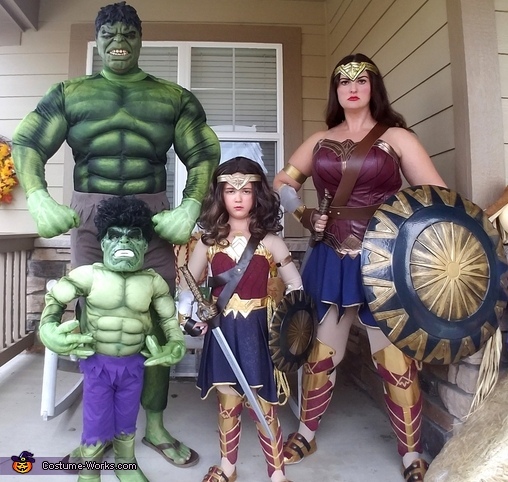 I created some "torn" purple pants that minic'd Josh's and sewed them on, added more elastic and padding in his face mask for comfort, cut and styled a women's bob-cut wig to create "Hulk hair" and attached it to his mask, and altered The costume's length. My daughter is all about Girl Power, so Wonder Woman was her choice of character this Halloween. We are both fans of the new age Wonder Woman, so I knew I had a lot of things to make. For Collins' costume, it is almost entirely homemade (except for her sword, headband, parts of her skirt, and shield). Her top is made from a leotard that I drew symmetrical lines on to add depth with fabric, ribbon, and cardstock accents on the top. I also used fabric, ribbon, and cardstock to concoct our awesome arm guards and leg guards. Our shoes are slippers that I covered in gold duct tape and layered with cardstock/fabric buckles with buttons and elastic. I also made our leather sword body straps with button accents and our leather hand protectors. Both of our skirts were purchased and then I trimmed, shaped, and sewed them to make the iconic Wonder Woman bottom half. My top was purchased, but I drew the same lines like Collins' to match. I also covered our costumes in gold glitter because what girl doesn't love a little extra sparkle? My headpiece was made of cardstock, glue gun, and elastic and then painted.